The simple and most striking thing from visiting the Netherlands was the freedom and ease to simply cycle where you need to go with ease. Even when it comes to public transport, the ability to easily connect and move throughout the country is abundantly apparent. On peering out the windows of the intercity train between Amsterdam Schiphol and Utrecht Central, you can see there is also a good provision of national roads for motor traffic (these are known to regularly suffer congestion — ed). 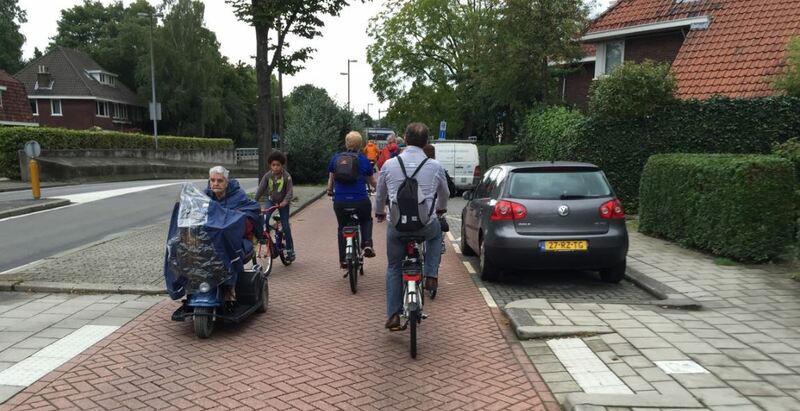 IMAGE: Separate cycling paths and service streets with limited car access (as above in Utrecht), enables everybody from children to people with mobility challenges to move about their city. When we get to the cities, we see that cycling is not just separated along streets, but also at junctions where cycling is controlled differently to motor traffic. There are very few times that cycling with motor traffic is mixed and when that does happen, it is not on busy arterial roads, but only on quieter low traffic volume streets. Drivers are typically respectful of people cycling, where the common rationale is people driving today are people cycling tomorrow, so people are fully aware of the need for space and to slower speed around cyclists. When it comes to mixing cycling and driving on typically residential and city centre streets, the speed limits are set to 30km/h and the opportunity for rat runs is removed — like in the first picture above showing a bicycle street in Utrecht, which is one-way for driving and two-way for cycling. The streets are made cul de sac for motor traffic or orientated one-way for driving, but are two-way through routes and two-way for cycling. Such streets may also include colouring the road surface red or cobble in order to make it look and feel like a street rather than feeling like a black road highway. IMAGE: A rural setting where the centre line is removed and motor traffic drive in the middle to overtake or pull in to let motor traffic past. This was the same for semi-rural roads linking populated areas that would have cyclists making a few short KMs of a journey. The speed limits are set at 50/60km/h and have key road markings and/or surface colouring which help promote a more balanced and fairer use. A road where overtaking speeds are reduced and the space given to cyclists is much safer. Cycling promotion is a key factor and something that is visible in various ways around the city streets and train stations. It’s the simple understanding that cycling is of key importance and a necessary mode of transport in order for the cities to function properly. Anything that can be done to make cycling easy is done. Even little things like monitored bicycle parking with free buggies to assist with shopping, cheap rental of electric cargo bikes to assist with getting that large item home, and vending machines with wet gear and umbrellas. 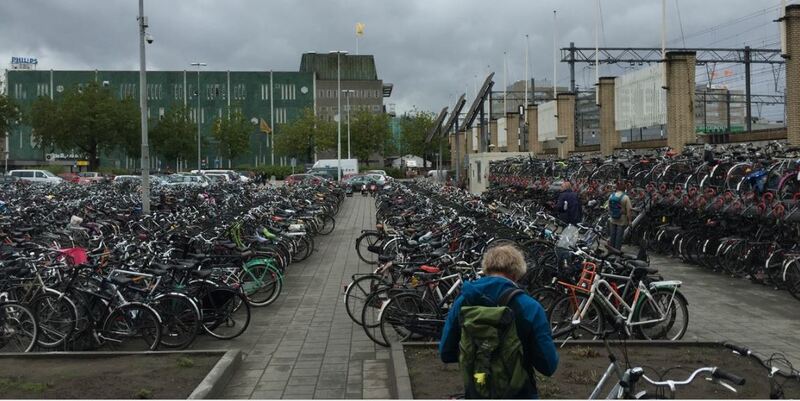 IMAGE: Just some of the bicycle parking at Eindhoven train station with 1,000s of bicycles spaces — a more efficient use of space than car parking. Park-and-ride at train stations was another key part of the overall picture with significant investment being made to encourage people to cycle rather than drive to their local train station and use the secure bicycle parking. This strikes as a much more efficient way to use the limited space around suburban train stations. The person then takes the train as a foot passenger to their destination then walks or takes a second bicycle to their workplace. It’s also possible to take a full-size bicycle on the train outside of peak travel times, with no concerning restriction on the number of bicycles. 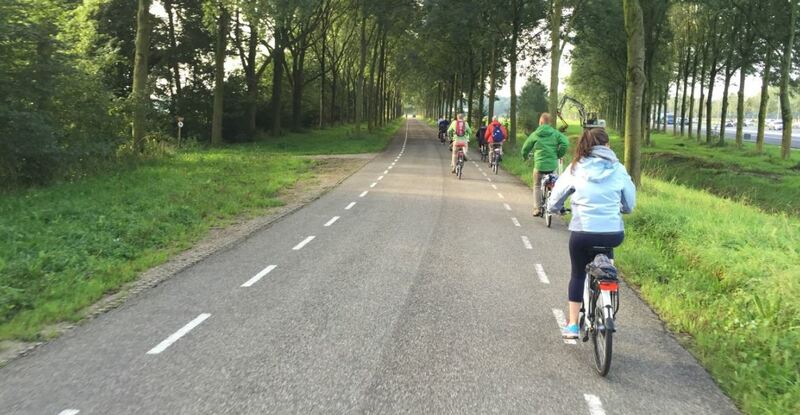 The study tour was a great opportunity to go to the Netherlands on a trip with a line-up of Dutch council officials, cycling promoters, cycling engineers and urban planners. It added to the opportunity that some of our own Irish councillors and engineers were a part of the visiting group. The overarching lesson learnt from the trip, was the need for us to implement a good cycling network and do much more to make cycling easier. The benefits of having a much higher percentage of people cycling in our society gives us so much in return. Through the relief of a person’s daily cost of transport to the easing of traffic congestion. From the reduction in air quality issues to the increasing of people’s general health. It’s not just about commuting to work, but also shopping and socialising and the equal opportunity for people of all ages and abilities to move around with safety and confidence. It’s really good, the cycling infrastructure they have over there. I’ve ridden it a few times and love it. Both in the city and out in the country. It’s good to keep pushing for a cycling network in Ireland. Even if things look bleak now, political winds can change rapidly so it’s good to be ready for when that happens. When politicians who were against it suddenly overnight do a one-eighty and want to know what to do. At that point if you have plans and policies ready you’re not scrambling to get them together.